I saw the alternating striped and plaid shirts over skinny jeans and under stocking caps through the glass walls even as I approached Berlin Currywurst in the rain. The interior of the former mom and pop pupusa spot had undergone minimal renovation and now carries a very different vibe, albeit more appropriate and fitting into the context of Sunset Junction. 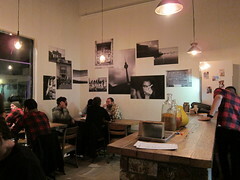 The yellow walls have been whited out and a mosaic of B&W photography is now the centerpiece. Diners eat at distressed wooden tables on school chairs and benches. I’m loving the concept because, ironically, Berlin Currywurst is exactly where I want it and I know that it’s not going to drive away like another Los Angeles food truck, forcing me to check Twitter the next time I have a craving for Germany’s “National Dish” (while subsequently becoming disappointed it’s not in my neighborhood). It does run you double what it would cost you to eat at a stand in Germany, but it’s understandable considering they have rent to pay. Perhaps it’s evidence that “hipster” has increasingly evolved into a state of mind and less of one’s unemployment or (lack of) finances. This is easy, accessible German street food that crosses all echelons and classifications – yet eaten with tiny wooden spears. You won’t find any silverware at this spot. After all, it’s not meant to be gourmet rocket science. Rather, it’s almost-finger food, customizable both in flavor and in heat, and served up with a side of fries and onions or jambalaya. Pick your wurst, ranging from Bratwurst (pork), Bockwurst (veal and pork) and Rindswurst (beef) to Geflugelbratwurst (chicken) and more – with a couple of tofu options to boot. Each serving starts at $5.89 and comes with two slices of negligable “German farmer’s bread.” It’s OK to sop up the remainder of your ketchup-curry powderÂ sauce, but I’d highly recommend getting a side of fries with onions to share. 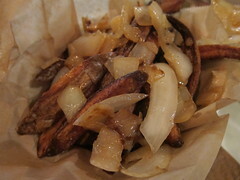 The potatoes were fried and salted to a perfect crisp and, together with sauteed onions, were as solid as any I’ve had. 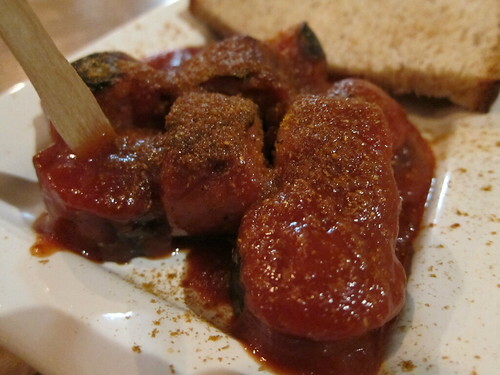 As for your currywurst, you pick the level of heat ranging from 1 – 4 (#3 comes with an Age 16+ disclaimer) and you can flavor your sauce with “Prenzlauer” (fruity), “Kreuzberg” (chipotle), “Mitte” (jambalaya) or “Alexanderplatz” (garlic) for an additional $0.89. I went with Level 3 and the chipotle flavoring, which was a nice way to kick it up a notch. I’d predict that the original sauce might be a bit sweet for my tastes. After all, I’ve always preferred mustard to ketchup. And now, I’m curious about Level 4. We ordered the Paprikawurst (pork, paprika, garlic) and the Scharfe Kasewurst (beef, jalapeno, cheese) mistakenly in the same sauce, but it became a good canvas to determine that the latter definitely wins out in terms of flavor. Alas, they don’t have beer, but malt beer and Izze. But I very much enjoyed their Virgil’s Cola – a bottled root beer they carry in their small counter refrigerator. It remains to be seen whether they’re looking to change that. All the same, I’m thinking that it would hurt their turnover within that small space. 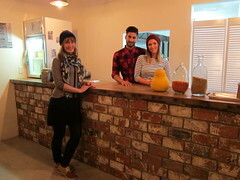 Berlin Currywurst employs a simple business model that fits just perfectly into that corner space at The Junction. It’s a great place to get your fix – easy in, easy out, no nonsense. And at the center of it all is a fail-proof recipe for Germany’s favorite food. Now Silver Lake gets a piece. This entry was posted in Food, Silver Lake and tagged Berlin, Berlin Currywurst, curry powder, German, ketchup, L.A., los angeles, sausages, Silver Lake, street food, Sunset Junction. Bookmark the permalink.